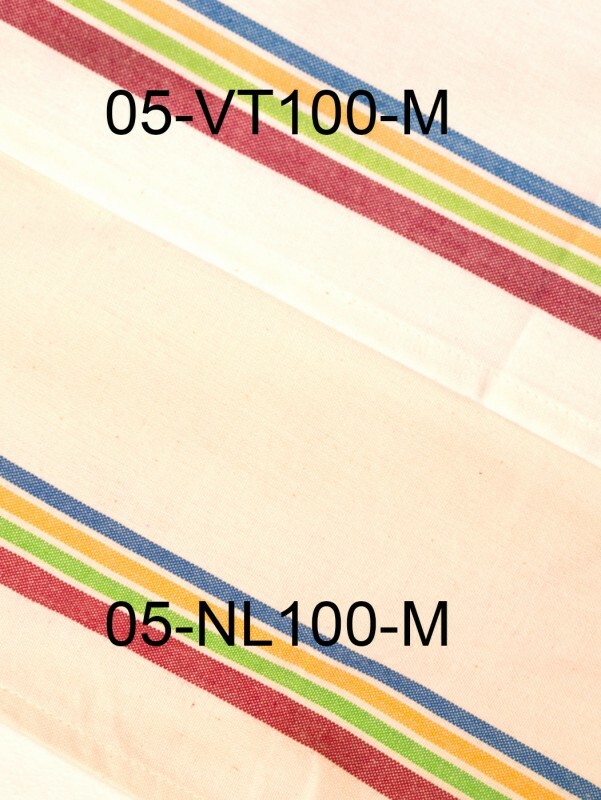 With the introduction of our Vintage Striped Kitchen Towels in Natural, you now have two choices of fabric color. 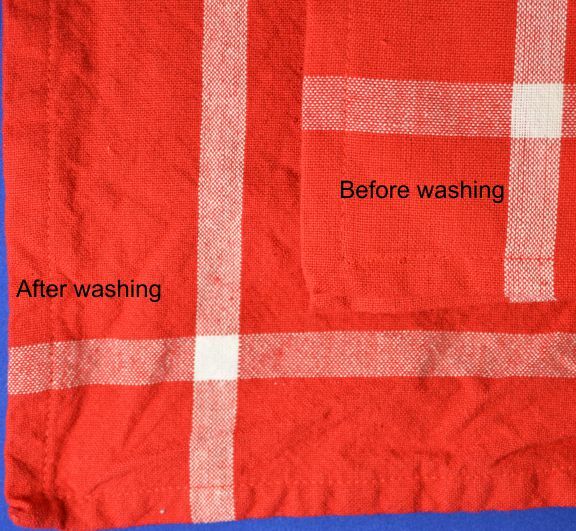 The new towel has a natural, off-white color as a background (pictured below in the lower part of the frame). Compare this to our classic Vintage Striped Kitchen Towel, which has the white background (pictured below in the upper part of the frame). The difference in color is small, but visible when they are laid side by side. Both are great choices for 100% cotton kitchen towels! Few gifts are treasured more than those made of fine fabrics like linen or cotton. They become even more precious when personalized with your machine embroidery for a noteworthy event or a special individual. Over the next few weeks, I will be posting segments on how to successfully embroider on delicate and light weight fabric like the beautiful handkerchiefs from Embroiderthis.com. This part Part 1 installment will help you choose the right tools for this type of an embroidery project. First, always begin with quality cotton or linen handkerchiefs. Best results are obtained when embroidering on an item made from natural fiber if it has been pre-washed to allow for any shrinkage that might occur prior to embroidering. It is also a good idea to press the item while it is still slightly damp applying a light layer of starch to give body to delicate fabrics. The fine linens from Embroider This! , including our handkerchiefs, are pre-washed and ironed with starch during the manufacturing process so they come to you ready for embroidery when you take them out of the package! After embroidery, Embroider This! recommends a gentle cold water hand wash and air dry for the care of their fine handkerchiefs. You will also need a few other tools for your embroidery project. The use of a new machine embroidery needle in size 75/11 is a necessity to prevent any pulls or snags when embroidering on delicate fabrics. Embroider This! offers Organ Titanium Machine Embroidery Needles that are considered the best in the industry. These machine embroidery needles are the choice of embroidery professionals and stay sharp much longer than other brands. Since both sides of the final product will be seen, a sheer stabilizer like Sulky’s Soft ‘n Sheer is the stabilizer of choice. A temporary fabric adhesive like 505 Spray offered by Embroider This! may be used to temporarily secure the item in the hoop or you may prefer a fine straight pins like size 22-ulta-fine. Part 2 will Detail the hooping process for handkerchiefs. The final element to the success of embroidering delicate fabrics like handkerchiefs is your choice of embroidery design. Choose one that is light and airy like the fabric and be sure the stitches are not too dense in any part of the design. Avoid designs that include heavy underlying stitches or one in which several colors are embroidered on top of each other. Heavy or dense designs do not look pleasing on the delicate fabric of handkerchiefs and may put stress on the fabric. To help you choose an appropriate designs, it is recommended that you take the time to stitch out a test sample of the design. Although this test stitch step seems time consuming, it will ultimately save you time, money and heartache later on by helping you make the best choice of design for your delicate handkerchief before you start to stitch and prevent you from making a frustrating, expensive and time consuming mistake! If you decide to stitch out a sample, use inexpensive lightweight muslin or batiste fabric which has been pre-washed and dried so it mimics the handkerchief fabric you will be stitching on later. If you have more experience with designs and different fabric types, you may be able to view the design in a software editing program and evaluate it’s density in relation to the delicate fabric. 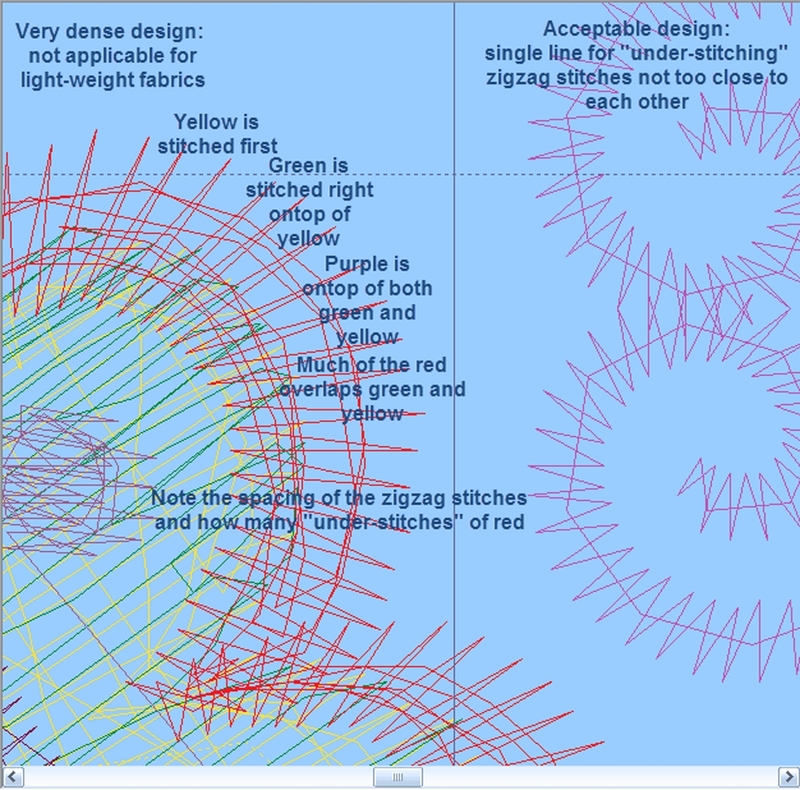 If you have design editing software, you can view the amount of stitches that are stacked on top of one another and evaluate the denseness of the design. Some programs also allow you to reduce the density of the design. The following diagram illustrates what a dense design and a light, airy design look like in your embroidery editing program to help you learn how to choose the best designs for your handkerchief project. Embroider This! offers over 300 Free Embroidery Designs and several free designs that have been digitized specifically for the fabric weight of handkerchiefs. Over the next few weeks, I will be posting more installments on “How To Embroider on Delicate Fabrics”. The next post will teach you the best way to hoop delicate fabrics and this will be followed by tips and tricks for how to use a printed template, design placement tips and tricks, thread choices, and using organza fabric to stabilize delicate fabrics. I will be adding new free designs you can download from www.embroiderthis.com to go along with these projects. I’m traveling all of next week so look for the next installment of these posts at the end of April. I hope you enjoy this series on “How to Embroider on Delicate Fabrics” and I hope it increases your creativity and confidence with machine embroidery. Please leave me a comment to let me know your feedback! The Men’s Satin Banded Handkerchief is the long-standing standard in a cotton men’s handkerchief. It is man-sized at 16.5 inches, is made of durable 100% cotton, and had the banding along the edge that gives it a touch of elegance. 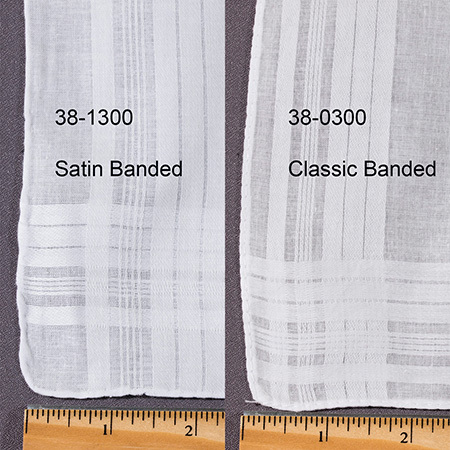 As you can see, the banding in the new Classic Banded is closer to the edge of the handkerchief. The other difference is the hem – the Satin Banded is a hand-rolled hem, while the Classic Banded is stitched. However, both are great everyday handkerchiefs, sure to please the gentleman (and gentlemen always carry handkerchiefs!). Ramie, pronounced either ray-mee or rah-mee, is a natural fiber produced from a plant that is part of the nettle family. Although not well known in the United States, cloth made from ramie has around since ancient times – it was used to wrap Egyptian mummies as early as 5000 B.C., and it has been used in China for over 2000 years. Ramie has an unevenness of fiber that resembles the thick-and-thin appearance of linen. It is one of the strongest natural fibers, somewhat stronger than linen, particularly when wet. Ramie is extremely absorbent, softer than linen, and more easily dyed. It does not shrink, so it is frequently used as a blend with cotton to reduce shrinkage of a fabric item. Ramie, like linen and cotton, wrinkles easily. Like linen, sharply pressed creases tend to be difficult to change, so it is best stored flat. Ramie shares linen’s natural stain resistance, and it can be machine washed with cold water and then line-dried. 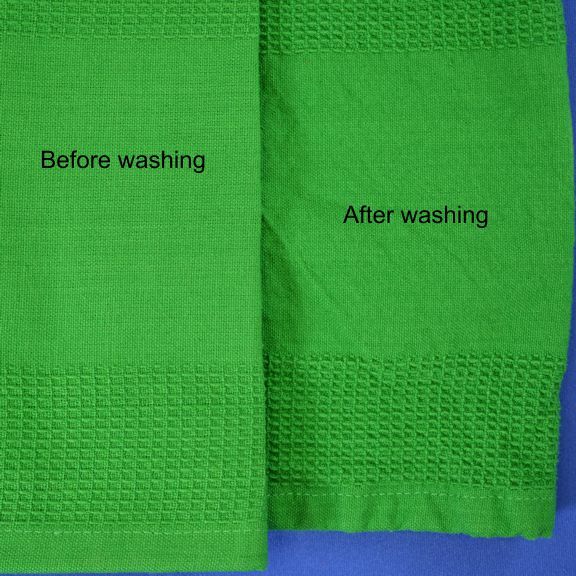 In both cases, these towels proved to be able to stand up to washing, making them a great item for your embroidery.